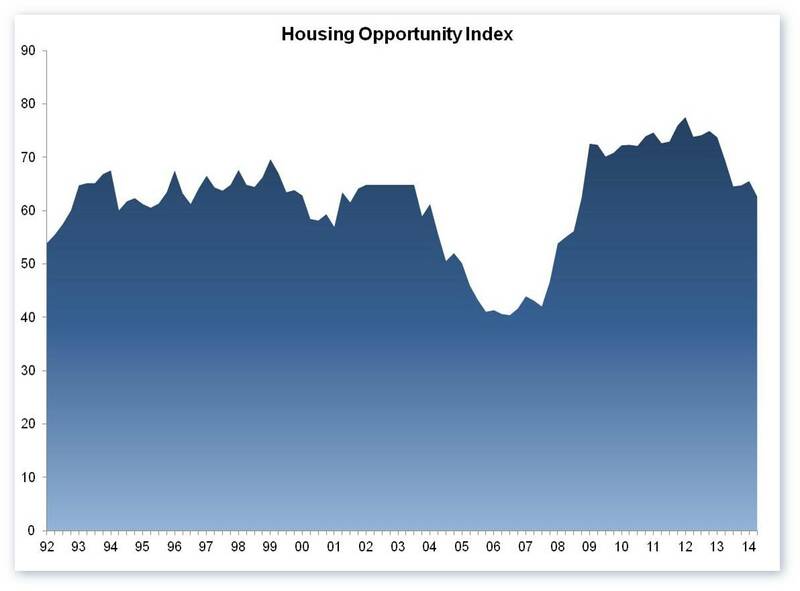 Housing affordability dipped slightly in the second quarter of 2014 as several markets saw a firming of home prices, according to the NAHB/Wells Fargo Housing Opportunity Index (HOI). Nationwide, the second quarter HOI was 62.6—i.e., 62.6 percent of new and existing homes sold during the quarter were affordable to a family earning the U.S. median income of $63,900—down about three percentage points from the first quarter reading of 65.5. Among individual metros, Youngstown-Warren-Boardman, Ohio-Pa. claimed the title of the nation’s most affordable major housing market, as 90.4 percent of all new and existing homes sold in this year’s second quarter were affordable to a family earning the area’s median income of $52,700. Cumberland, Md.-W.Va. was the most affordable smaller market, with 97.2 percent of homes sold affordable to a family earning the area median income of $54,100. Other major markets at the top of the affordability chart were Indianapolis-Carmel, Ind. ; Syracuse, N.Y.; Harrisburg-Carlisle, Pa.; and Scranton-Wilkes-Barre, Pa. Smaller markets joining Cumberland at the top of the affordability chart were Kokomo, Ind. ; Davenport-Moline-Rock Island, Iowa-Ill.; Battle Creek, Mich.; and Lima, Ohio. For a seventh consecutive quarter, San Francisco-San Mateo-Redwood City, Calif. was the nation’s least affordable major market, with only 11.1 percent of homes sold in the second quarter affordable to a family earning the area’s median income of $100,400. Other major metros at the bottom of the affordability chart were Santa Ana-Anaheim-Irvine, Calif.; Los Angeles-Long Beach-Glendale, Calif.; San Jose-Sunnyvale-Santa Clara, Calif.; and New York-White Plains-Wayne, N.Y.-N.J.
All five of the nation’s least affordable small housing markets were located in California: Santa Cruz-Watsonville, Napa, Salinas, Santa Rosa-Petaluma, and San Luis Obispo-Paso Robles. For additional detail, including the complete set of HOI tables and historic data, please visit nahb.org/hoi.